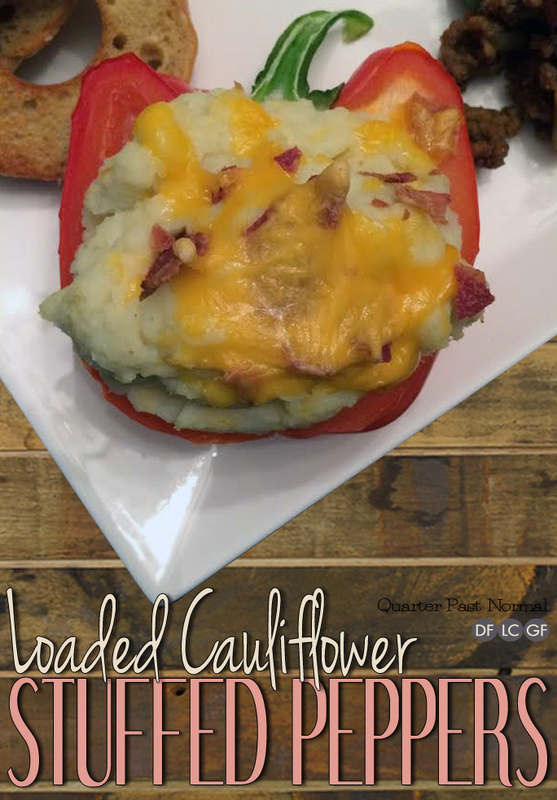 That’s when I thought – hmmm I can make a loaded cauliflower mashed stuffed pepper. So I did. I made that pepper and I made that cauliflower mashed and I stuffed one inside the other and it was delicious. Sometimes you just have to think outside the pepper. Bring a large pot of water to a boil. Cut your pepper in half length-wise being careful not to remove the stem. Scoop out the seeds and place the pepper in your boiling water. In another pot bring some more water to a boil. Add in your chopped cauliflower and let boil over medium high heat for 7-10 minutes. Place two slices of turkey bacon on a paper towel lined plate and microwave for 3 minutes. After 5 minutes, remove your peppers from the boiling water and place on a baking sheet. Once your cauliflower is fork tender, strain and return to the pot. Add in your butter and using either a potato masher or an immersion blender, mash your cauliflower until smooth. Scoop to fill your peppers. Add one strip of bacon over top of the cauliflower and top each with cheddar cheese. Bake for 10-12 minutes, until all the cheese has melted. Note: You can add sour cream, green onions or anything else you might put on a loaded baked potato.